Harrison's Talent Acquisition solution enables you to hire the right talent - and do it quickly. Filter and rank the best candidates before you review resumes or interview. Quickly identify, interview, attract, and hire the best candidates using predictive analytics. Our award-winning recruitment technology pre-screens applicants for qualifications and job specific behavior providing actionable data for effective decisions. 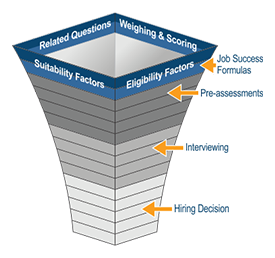 Our Annual Assessment Agreements (AAA) provide unlimited screening, complementary Your Greatest Strengths Reports for every applicant, and development and behavioral competency reports for every employee - All for a low yearly cost based on employee numbers. General personality tests measure only 4-20 personality factors and can help employees become more sensitive to others with different behavioral styles. However, to effectively predict job success, assessment needs to be comprehensive and job specific. The Harrison SmartQuestionnaire measures 175 behavioral factors that include personality, attitude, motivation, work values, interpersonal skills, engagement factors, retention factors, and behavioral competencies. Each assessment is customized to be job specific and supported with 30+ years of job performance research.